Program implementation is defined as a specified set of activities developed to put strategies of the program into practice. Based on the program or intervention goals and objectives, an implementation plan (See Section 1.3) should be developed to provide a detailed framework for the activities, including what the activity is, who is responsible for the activity, and what the timeline is to achieve the objectives. For a program whose goal is to increase access to high-quality contraceptive services, program implementation should focus on activities specific to contraceptive service delivery. This Section addresses basic components of program implementation. 3.1 What are the key components of service delivery? Service delivery is providing a specific set of health care services to patients to meet their health needs and expectations. In a program to increase contraception access, the delivery of high-quality contraceptive services includes screening women for pregnancy intention; providing women with client-centered contraceptive counseling; using evidence-based guidelines to initiate contraception and manage side effects; and ensuring the patient’s choice in method selection, discontinuation, and method switching. The development of service delivery strategies ideally includes careful assessment of any intentional or unintentional barriers that may block women’s access to services and removal of these barriers in accordance with evidence. It also is important to assess the quality of service delivery from the perspective of women who have received services and to compare this information with the data reported by providers at the time of service delivery. Intake: A front desk or administrative person, support staff, or nurse may be responsible for intake. 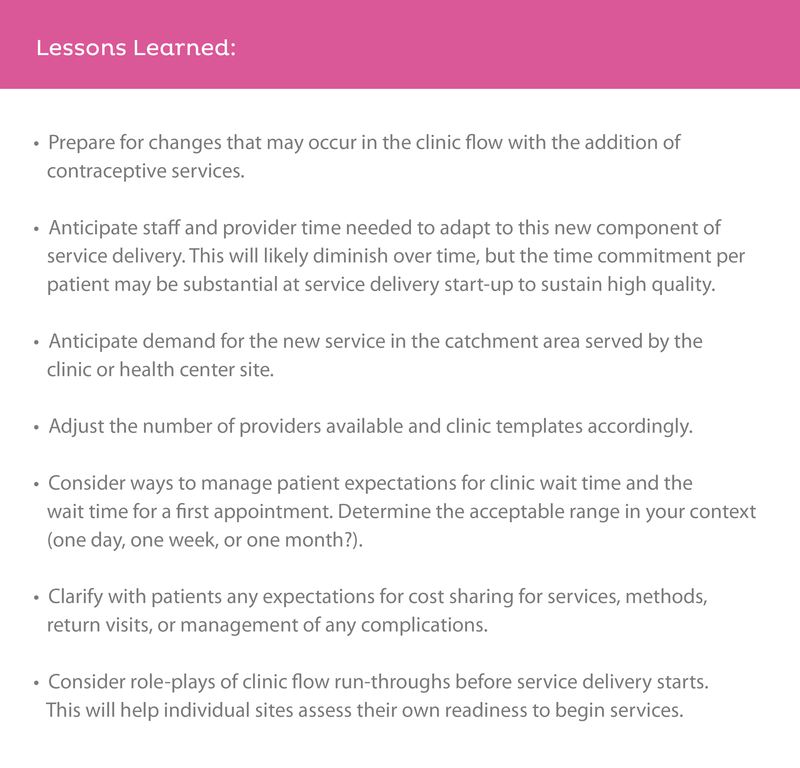 Ideally, all staff involved in contraception service delivery are well informed on service processes and procedures such as data collection forms, available methods, and cost sharing. Assessment of eligibility for method of choice and for initiation of method on the same day of the visit (Quick start). Patients who select a long-acting reversible contraception (LARC) method (intrauterine device [IUD] or implant) receive the insertion of the chosen LARC method, discussion of potential side effects and management strategies, awareness of danger signs, and instructions for follow up. Return visits: These visits may occur as planned visits or visits made due to side effects, questions or concerns, desire to discontinue or remove a method, or to switch methods. It is important during all visits, including return visits, to ensure patients receive client-centered counseling and that providers respect patients’ autonomous decision-making.  Ideally, all data collection and clinic visit forms use standardized indicators that are tied to the particular program. Different contexts or settings may add other indicators, depending on the situation (pandemic, natural disaster, conflict, preparedness, stable setting). 3.2 What data should we collect during a patient encounter? Collecting data to monitor program activities and evaluate your program’s impact is a key component of program implementation. There are various methods for collecting patient encounter data, and the best method for your program will depend on many factors as described in Section 2.6. When thinking about the types of data to collect for your program, consider your program needs, who will be collecting the data, and how the data will be used. 3.3 How should we handle patient charges? Your program or intervention should establish policies and procedures that define which components of the program are offered at no cost to the patient; which services patients will be expected to pay for; and which services providers will be paid to do, either directly by the program or through an insurance billing or reimbursement system. Program staff must be well versed in these policies and procedures, so they can provide an explanation of anticipated cost to patients before any visit. This explanation should describe services offered and any charges that might be incurred, if the patient qualifies for a sliding fee scale (if applicable), if an insurance program will be billed, or if there will be any out-of-pocket costs.  Clinic staff should be able to answer patient questions and effectively communicate the reason for any out-of-pocket costs. The Z-CAN program provided women same-day access to contraceptive services at no cost. Policies and procedures developed for Z-CAN physicians and clinics included clear language defining what contraceptive services the Z-CAN program covered and did not cover. Example scenarios were provided to Z-CAN clinic staff to help them understand how to apply the charge policies to patient scenarios. These examples of Z-CAN policies and procedures can be adapted for your program. 3.4 What clinic equipment and supplies will we need? Successful implementation of your program requires that providers and clinic staff have access to all of the equipment and supplies necessary to provide services. Whether these are provided by the program or are minimum requirements for participation in the program will depend on the program’s budget and the general availability of the items for standard services. Equipment and supplies for securely storing contraceptive products, insertion of LARC methods, and collecting, submitting, and storing Z-CAN program data were requirements of the Z-CAN program. The availability of the required equipment and supplies was assessed in each clinic during the clinic mentoring visit (See Section 2.4). While the equipment and supplies needed were typical of an obstetrics and gynecology (ob-gyn) practice, the Z-CAN program identified five key items that could be provided by the Z-CAN program to clinics if needed (uterine sound, tenaculum, ring forceps, os finder, and refrigerator).